Managing multiple client projects can be difficult for even the most experienced project manager. When a design project starts, the manager doesn’t only concentrate on the aesthetic, there are various other factors that affect the success of the projects—project planning, resource allocation, scheduling, balancing budgets, etc. While many aspects of project management may seem complex, understanding of the fundamentals can make large difference to project’s profitability. Because of this, it’s vital you head into your client work armed with the knowledge and tools to keep things on track. To help identify project management tips that can keep your team on track, check out this guide and establish a solid foundation for managing your next client project. It is critical to document business objectives and requirements in a detailed scoping document. In-experienced project managers might omit this step, which can lead to costly project budgeting and schedule overruns. Do adequate documentation and planning up front to mitigate execution risks. It’s crucial to involve everyone from designers, copywriters and creative directors to internal or external clients, so you don’t leave out parts of the process that you simply don’t know about. Include every single step and avoid the temptation to document the process you wish you had. However, note that “highly comprehensive” does not always mean better. Keeping every task, irrespective of whether they are large or small, in a project plan results in micromanagement issues. Instead, build a plan to manage the tasks at a higher level and provide the resources detailed task checklists that they can self-manage and give you the rolled-up status for your schedule. A project management tool such as TeamWave can be used to store the document via file manager to ensure that the all the team members are on the same page and it is easily accessible for quick reference. With a sufficiently detailed document, it should be easy to transition into kicking off the project with your team. According to the finalized project plan, carry out the following activities. Breakdown of tasks. Include all the steps to get from starting point to finishing point. For example, your website design project can have several high level task groups like information architecture, wireframe, graphics, conversion to HTML/CSS, etc. Each of these steps should have an established process. For example, IA can involve different steps like business intent, user intent, content organisation, relationship and navigation. In these cases easy to use PM tools like TeamWave would allow you to create the task groups and individual tasks. Team roles. Now that you have broken down the tasks into smaller tasks, determine who on your team will do what. Include internal QA tasks that precede sending deliverables to the client for approval. Also be sure to include client tasks, such as reviewing and approving initial mock ups. Due Dates. Your project plan should include deadlines for you and the client, broken down for each deliverable. Dependencies. Make sure your team knows what pieces depend on other pieces to be finished before they can be implemented, so all of the different parts can come together smoothly. Always start with internal communication, i.e., conduct short internal meetings for updates and finalize next steps to keep the complex project moving. Next step is communication with your client as it is critical throughout each project cycle. Inform the client and stakeholders about the expectations from them in order to keep the project moving along to meet the deadline. Then, during the course of the project, send reminders to the client of upcoming milestones. Whenever there is any delay or bottleneck, communicate the details to the client immediately. It’s also a good idea to give clients/stakeholders product demos as you progress. Demos allow decision makers to see for themselves if the project seems on track, ahead of schedule or behind schedule. These type of meetings can be swiftly scheduled and the members can be notified via TeamWave’s event scheduling feature — from one-off meetings to daily stand up meetings. Your project management application should have the functionality to invite the clients into the project easily so that certain deliverables can be shared with clients for feedback. There must be provision to keep specific tasks private in the project that would be only visible to the internal team. Your team members should also be able to comment on the tasks to provide inputs and brainstorm by creating messages with respect to the project. If you’re billing the client by milestones then be sure to add the milestones on the project calendar so that your invoices get regularly cleared. On the other hand, if you are charging clients on the basis of the number of hours, then make sure that the team members are regularly logging the billable hours. TeamWave’s time log feature lets you track time and reporting functionality allows you to quickly download the time spent on various tasks (which can be imported to invoicing app). Also, the milestone scheduler reminds you when the timeline approaches the pre-specified date. When managing deadlines and projects, consider potential resource and technology challenges that might emerge. Ensure that there is time allocated for undiscovered work and develop a contingency plan for it. Lots of projects assume an ideal path, but do not plan for unanticipated and undiscovered work, which is bound to happen. Similarly, it’s important to keep an eye out for potential conflicts that could interfere with your project, such as other projects requiring your resources. Learn how team members can handle at once, because giving someone more than they can handle will jeopardise deadlines. While generic project management apps allow you take care of the above-mentioned factors in some way, the need of the hour is to approach project management in a holistic manner. Essentially, project management should be considered as an integral part of other business functions like CRM and HRMS. For example, while starting a project you would ideally want to transfer some of the crucial files (including requirement documents) that were associated with the deal while your sales team was pursuing the client. Apart from that if there are opportunities for up-selling or cross-selling, then it is best to keep the deal in CRM app linked with the project. This will keep your sales team and delivery team on the same page minimizing any possibility of missed opportunities for revenue generation. Moving to the people management aspect, there is a close connection with HRMS — you would want to track the feedback given by the client for a team member along with adherence to the timeline while completing different tasks. This can be highly useful during the performance appraisal period. 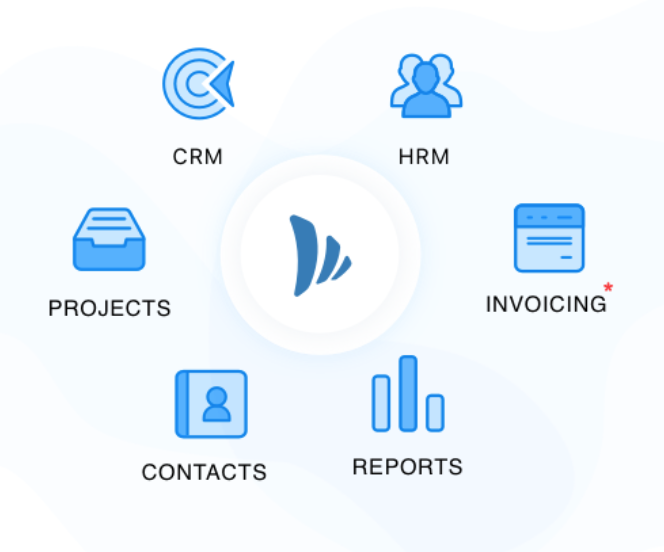 This is where TeamWave comes into the play; you not only get all the benefits of a project management app via an intuitive UI and power-packed features, but also get to use CRM and HRMS app via native integration (owing to the unified nature of the platform). In terms of pricing, the whole platform including the three apps costs $3 per user per month in case of annual subscription which is a fraction of other stand alone project management apps. Sometimes managing a web design project can be too overwhelming. But, you can keep everything streamlined by following a process and selecting the correct project management app. Start with clear expectations, do the preparation, keep communicating, and stay focused, and your projects will get completed one milestone at a time.